I met Matt and Andy Thompson in April of 2000, when they came to Key West for the first time as The Thompson Brothers Band. They were in their twenties with a song on the radio, a video on TV and a record deal with RCA, and I loved their music and songwriting from day one. More importantly, we were fellow New Englanders who shared the same twisted sense of humor and propensity to laugh constantly at the absurdity of the music business. Matt and Andy played on my 4 Good Dogs CD and were the rhythm section on my Night on the Beach recording. We’ve shared more than a few stages over the years, mostly since Matt started playing both bass and drums simultaneously and they became the Massacoustics. We’ve always talked about writing and recording together, and this year the stars lined up and we got to do both. Andy produced and engineered this recording in their impressive studio in Nashville, we got to write two songs together, and although it wasn’t originally planned this way, the three of us played nearly every instrument on the record. Matt and Andy play about a dozen instruments between them, and we were having so much fun we just decided to keep it in the family. 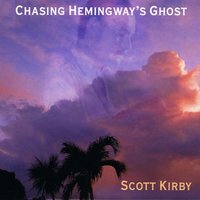 If you have missed the chance to make Scott Kirby's music a part of your personal soundtrack, use this new release as the start of something good. His fantastic voice and great songwriting are on full display here, from the title track "Chasing Hemingway's Ghost" to the fun of"We Own Key West". For that song, the line "you could throw a bowling ball down Duval" is just one example of the word pictures painted by this talented singer. As with his other albums, he collaborates with amazing musicians for a unique and wonderful sound.